Zirconia crowns and dental bridges are made from high-grade zirconium oxide; now you can achieve the best of both worlds with beautiful all-ceramic crowns with the strength of crowns made from ceramic fused to metal. 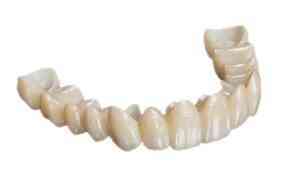 Lava crowns and bridges are not an alternative to PFM, but rather a replacement. Zirconia crowns and dental bridges are the strongest, most aesthetically pleasing restorations on the market and the innovative mechanical properties of the zirconia restorations allows for the fabrication and positioning of units up to 6mm in length without any compromise on durability or life expectancy. How Does Lava Benefit Patients and Dentists? Excellent biocompatibility. 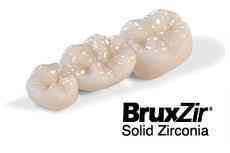 Solid zirconia will not chip or fracture as ceramic crowns may do under heavy occlusal force.